I studied up on all my stories, studied up on my Factor stories and my five points, and…..I NAILED it. I walked out of that oral board on cloud 9 because I answered concisely, confidently, and I didn’t get rattled. I easily catered my stories to fit their questions and I actually enjoyed it, believe it or not. I got the job! 1,700 applied, and 28 were invited to the Academy. I can’t thank you enough for preparing me so well for this! I will be recommending you strongly to my good friends. * The difference between a behavioral question and other questions is what the question asks. A behavioral question will be very specific. Example – “Tell me about a time when you solved a problem,” the key words are “a time.” This answer calls for a “specific” example of a “specific” incident. A story. 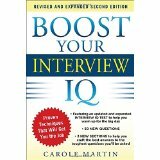 Book Recommendation – Behavioral Questions – and Answers – easy read – quiz. Next Next post: Q. How much time will I need? I’m, not sure how if I have enough time.